The state-of-the-art Chief MIWRFUB is a fully integrated, pre-assembled swing arm, fitting flush inside the wall with a low-profile finish. 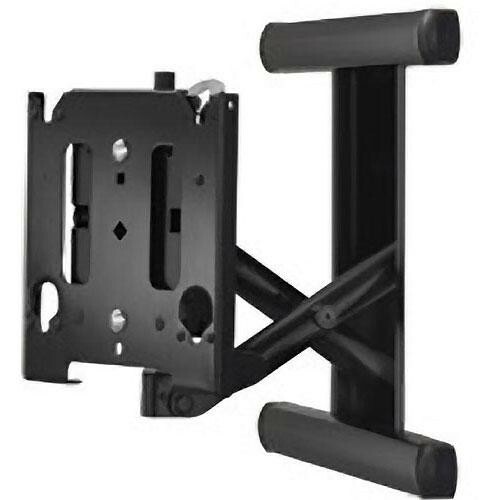 Designed for 30-50" flat panel displays up to 125 lbs, the MIWRFUB allows perfect TV placement during installation without cutting studs or having to retrofit existing wall structures. Simply cut out the drywall at the desired wall location and install the in-wall box. In addition, installation is made easier with built-in lateral shift and height adjustment. Integrated cable management and a trim kit are provided for an aesthetic and low-profile finish of less than 2". Users have increased positioning flexibility of their display with wide viewing angles. Optimal viewing is achieved with 37° of left/right swivel, up to 9.9" of extension, fingertip tilt, and ultra smooth movement. The MIWRFUB includes a universal interface bracket making it compatible with hundreds of flat panel displays. However, if you want to confirm the compatibility of this mount with your flat panel TV or monitor, please visit Chief's MountFinder Pro. Comes complete, no assembly required. Includes template for easy measuring and simplified post-construction installation. Includes all wood stud installation hardware. Center flat panel on wall at any position on wall between 16" center studs without cutting studs. No header/footer necessary. Lateral shift allows perfect centering of flat panel between 16" center stud system. Can accommodate up to 3-1/2" of lateral shift adjustment (right or left display offset from center of studs). Built-in cable management channels for a clean installation. Designed to accommodate up to 1" of display height adjustment. The mount allows for the horizontal alignment (Roll) of the display to be adjusted up to 2° right or left to level the display after installing. Compact low profile design ensures mount remains concealed behind the screen. Optimal viewing is achieved with 37° of left/right swivel and ultra-smooth extension up to 9.9". Centris technology uses the center of gravity to achieve smooth fingertip tilt of +/-15°. Screen angle stays set until you decide to re-adjust. Comes with a 10-year warranty to ensure you receive the best product possible. Box Dimensions (LxWxH) 31.5 x 12.5 x 9.5"